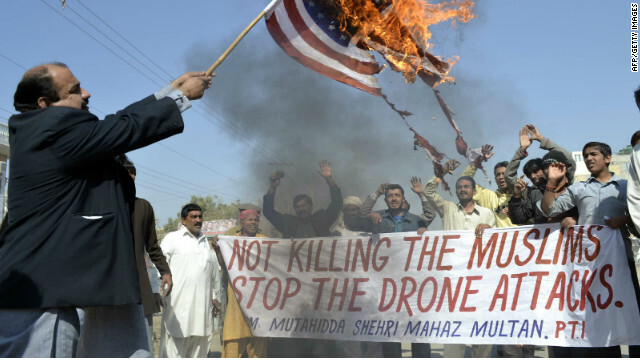 (CNN) — U.S. drone strikes in Pakistan have killed far more people than the United States has acknowledged, have traumatized innocent residents and largely been ineffective, according to a new study released Tuesday. This is serious, we’re finding some very strange intel from our sources on the ground, lets hope this is disinformation. A chilling report circulating in the Kremlin this afternoon released by the Aerospace Defence Forces (VKO) states that Kosmos 2479 detected the firing of two AGM-114 Hellfire missiles from a MQ-1 Predator drone yesterday being operated by the Central Intelligence Agency (CIA) over the United States city of Indianapolis that resulted in a massive explosion [photo 2nd left], and from local US media reports resulted in at least two deaths. Kosmos 2479 is an early warning satellite launched in 2012 as part of the VKO’s Oko programme and monitors the US from geostationary orbit for all possible threats, including the tracking of American airspace for US Air Force and CIA fighter jets, bombers and drones. The CIA’s MQ-1 Predator drones, equipped with two fearsome AGM-114 Hellfire missiles, have been described as President Obama’s “weapon of choice” and are currently most noted for bringing to Pakistan the same horror that Hitler’s doodlebugs inflicted on London during World War II. According to this report, after the firing of these drone-missiles, two distinct trajectories were recorded which were “near simultaneously countermanded”by countermeasures employed by an AN/ALQ-99 airborne electronic warfare system aboard a US Air Force EA-6B Prowler electronic warfare aircraft that had been dispatched from Wright-Patterson Air Force Base to track this CIA drone that had, apparently, deviated from its assigned flight track. Most ominous in this VKO report is its stating that the “intended targets” of these Hellfire missiles were the US Army Resource Services (PPBES) and the US Defense Finance and Accounting Service (DFAS), both located in Indianapolis, Indiana. The PPBES is tasked with overseeing critical, mandated, and/or sensitive US Defense and Army-wide programs including foreign currency fluctuation accounts, Individual Ready Reserve Mobilization of American Armed Forces, and is responsible for the evacuation of civilians in case of threats to the United States. The DFAS pays all US Defense Department (DoD) military and civilian personnel, retirees and annuitants, as well as major DoD contractors and vendors. DFAS also supports customers outside the DoD in support of electronic government initiatives. These customers include the Executive Office of the President, the Environmental Protection Agency, the Department of Energy, the Department of Veterans Affairs, the Department of Health and Human Services and the Broadcasting Board of Governors. Should the attack on either the PPBES or DFAS been successful, VKO analysts in this report say, the US Military establishment would have suffered a“critical blow” at the same time it is managing multiple wars across the globe, along with growing evidence of an internal power struggle between it and the newly reelected President Obama. As we had noted in that report, the toppling by Obama of General David Petraeus matched other top US Military leaders he has purged in the past 3 weeks, and which include: Rear Admiral Charles M. Gaouette, US Army General Carter Ham, Brigadier General Jeffery A. Sinclair, and US Navy Commander Joseph E. Darlak. “Two people were killed and about two dozen homes were damaged by an explosion in a south side Indianapolis neighborhood late Saturday night. The explosion was reported shortly after 11 p.m. near South Sherman Drive and Stop 11 Road on the south side of Indianapolis. Curiously to note in this reports conclusion is that this attack, should it have been successful, “nearly mirrors” that of the 11 September 2001 strike on the United States that Russian intelligence analysts still maintain was the “opening salvo” of a global economic war. Unbeknownst to the American people are that in the weeks prior to the 9/11 attacks, the entire western-backed global economic system was on the brink of total collapse due to massive fraud charges set to be filed against all of the top banks in the United States, but whose evidence was “conveniently” destroyed with the collapse of World Trade Building 7 which had not even been attacked. To the final outcome of these grim events now occurring in the United States it is not in our knowing, other than to note…and with each passing day…the situation for those in power, especially those who end up on the losing side, more closely resembles controlled chaos than anything else. November 11, 2012 © EU and US all rights reserved. Permission to use this report in its entirety is granted under the condition it is linked back to its original source at WhatDoesItMean.Com. Freebase content licensed under CC-BY and GFDL. Greece is becoming more and more traumatised by the Austerity measures put in place by our glorious EEC, yup, for some reason they want Greece on their knees begging for help from their Government. It’s so easy to control a population that has been humiliated, collapsed Economy, no hope, no escape, and all the world looks on doing absolutely nothing apart from rubbing their hands at the thought of how much money they can accrue because of this situation. The EEC is dead, it’s broke, skint, potless. We should pull out the EEC Intensive Care tubes and monitors and let the Economy die a distinguished death, not the painful grovelling, torture that the NWO is having such pleasure observing. Austerity has nothing to do with paying down Greek’s debt. After these new austerity measures, Greece’s current debt ratio will soar from 165% of GDP to 190% of GDP, making it even more difficult in the long run to pay down any debts. On top of that, the economy is projected to contract 4.5% in 2013, compared to previous prediction of 3.9%. And this is all happening six years after the economic crisis began. What most Americans fail to understand – and some Europeans are just starting to realize – is that the goal of the corporate masters and their austerity regime is not to make life better for the Greek people. ClimateViewer 3D – Let it Grow! – NEEDS OUR HELP! YOUR SUPPORT WILL HELP BRING THE GLOBAL SURVIVAL SYSTEM TO LIFE! Combining all of ClimateViewer 3D with automenta’s GSS, the possibilities are endless! ClimateViewer 3D contains Google Earth real-time data overlays, images, and links regarding climate pollution, nuclear test/power/storage, radar and laser locations all around the globe, as well as climate/real-time data and the military-college-industrial complex. While focusing on climate change, the database covers locations and data ranging from Star Wars to Climate Gate. It’s what you get when you mix George Jetson with Google Earth. This project is a labor of love. I’m fascinated with all things radiant, resonant, and electromagnetic. I love science and find these facilities intriguing, I hope you will as well. This is one of the most touching videos I’ve seen and creates such a positive message out of a such a dark problem – Suicide. I thought it was worth sending this out in these days of Austerity as a reminder, I’ve been in such dark moments myself where it was considered an option, I couldn’t do it to the people that loved me and what a waste. Anyway, Good Charlotte decided to record this some time ago during a growing culture of teenage suicide. It had an enormous effect with a right in your face composition with some heart jolting interludes. It’s worth a watch regulary …..
Earth is Ascending – 4D Here we come! Ok gang, pick the bones of this, good stuff and in line with the essence of what is happening ….